Thousands of householders are experiencing difficulties with water supplies because of freezing conditions across Northern Ireland. NI Water has taken more than 2,700 calls since 0800 GMT on Monday. The worst affected areas include Omagh, Ballymoney, Claudy, Dungannon, Dungiven and Limavady. The company said extra staff were working to take calls from people who were affected by burst pipes because of the sub-zero temperatures. There are problems in the water mains network as well as in customers' homes, the company said. Some householders have reported being without water for up to 36 hours. Northern Ireland Water has also asked businesses in Strabane, Omagh and Enniskillen to check their properties for burst pipes or leaks this morning. The company said home owners were responsible for the pipe work within their own property. A spokesperson said the company was experiencing "an increase in the number of burst water mains and increased flows from a number of service reservoirs across the province". He urged customers not to run taps in the mistaken belief that it prevents freezing. East Londonderry MLA Gregory Campbell said NI Water needed to ensure they had sufficient staff to take calls from the public. He said that one of his constituents had been without water for 36 hours and had not been able to find out when it would be restored. 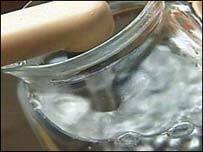 NI Water has asked anyone who notices burst water mains or "runs of water" to contact the company on 08457 440088.